SUBHEAD: 'Nature' is being renamed ‘Natural Capital’ – But is it really the planet that will profit? 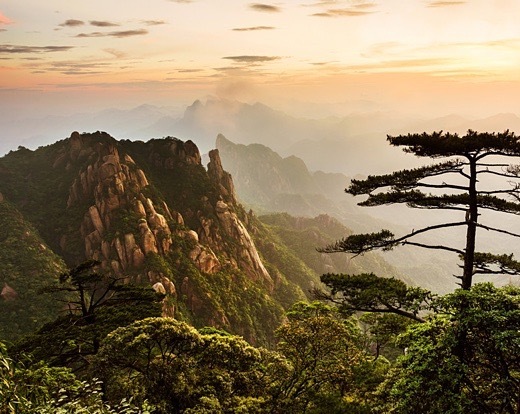 Image above: China’s Jiangxi mountains... is this just a corporate asset? From original article. The four-yearly World Conservation Congress of the International Union for the Conservation of Nature has just taken place in Hawaii. The congress is the largest global meeting on nature’s conservation. This year a controversial motion was debated regarding incorporating the language and mechanisms of “natural capital” into IUCN policy. Motion 63 on “Natural Capital”, adopted at the congress, proposes the development of a “natural capital charter” as a framework “for the application of natural capital approaches and mechanisms”. In “noting that concepts and language of natural capital are becoming widespread within conservation circles and IUCN”, the motion reflects IUCN’s adoption of “a substantial policy position” on natural capital. Eleven programmed sessions scheduled for the congress included “natural capital” in the title. Many are associated with the recent launch of the global Natural Capital Protocol, which brings together business leaders to create a world where business both enhances and conserves nature. At least one congress session discussed possible “unforeseen impacts of natural capital on broader issues of equitability, ethics, values, rights and social justice”. This draws on widespread concerns around the metaphor that nature-is-as-capital-is. Critics worry about the emphasis on economic, as opposed to ecological, language and models, and a corresponding marginalisation of non-economic values that elicit care for the natural world. The use of “natural capital” as a noun is becoming increasingly normalised in environmental governance. Recent natural capital initiatives include the World Forum on Natural Capital, described as “the world’s leading natural capital event”, the Natural Capital Declaration, which commits the financial sector to mainstreaming “natural capital considerations” into all financial products and services, and the Natural Capital Financing Facility, a financial instrument of the European Investment Bank and the European Commission that aims “to prove to the market and to potential investors the attractiveness of biodiversity and climate adaptation operations in order to promote sustainable investments from the private sector”. So what does the word “capital” do to “nature” when they are linked? And should nature be seen in terms of capital at all? One controversial aspect, backed by IUCN’s Business and Biodiversity Programme, is receiving particular attention. This is the possibility of securing debt-based conservation finance from major institutions and the super-super-rich based on the value of income generated from so-called natural capital assets conserved in situ. The report proposes a number of mechanisms whereby “businesses can utilise debt as a tool to restore, rehabilitate, and conserve the environment while creating financial value”. The idea is that as “environmental footprints move closer to being recognised as assets and liabilities by companies, debt can be used to fund specific investments in ecosystems that lead to net-positive financial outcomes”. Debt-based financing – for example, through tradeable securities such as bonds – is framed as attractive in part because interest received by investors is “usually tax-deductible”. In the documents above, financial returns are projected as coming in part from new markets in payments for ecosystem services and sales of carbon credits. These new markets will supply the potentially monetisable “dividends” of conserved and restored habitats as “standing natural capitals”. Investor risk is proposed to be reduced through mobilising these assets, as well as the “land or usage rights” from which they derive, as underlying collateral. The graphs above present two schematic diagrams redrawn from the Credit Suisse texts to indicate how these flows of financial value may be leveraged from areas capitalised as investable natural capital. The models are based in part on expectations that recent United Nations Framework Convention on Climate Change support for international carbon compensation mechanisms will release new long-term sources of public funding to “balance anthropogenic emissions by sources and removals by sinks of greenhouse gases”, thereby boosting possibilities for financial flows from forest carbon. Such financialising moves, nascent and clunky as they are, may yet have significant implications if applied to countries in the global south with remaining high levels of “standing natural capital”. Caution is needed regarding the possibility that forest-rich but least developed countries may become indebted to ultra high-net-worth investors who access returns on their investments from new income streams arising from conserved tropical natures in these countries. In 1986, the central secretariat of the WWF decided to change the name of the organisation from the World Wildlife Fund to the World Wide Fund for Nature. The thinking was that an emphasis on “wildlife”, borne of a concern for endangered species, no longer reflected the organisation’s scope of work for the conservation of the diversity of life on earth. It was considered that overall the organisation would be better served by the term “nature”. In other words, it seems that naming and framing “nature” matters. Given the conversations and debates at IUCN’s World Conservation Congress, it seems important to ask: how exactly does the conservation of natural capital equate with the conservation of nature? Do these terms in fact invoke different things? If they do, then it is worth clarifying whether the conservation of natural capital is always good for the conservation of nature. If they don’t, then it remains worth querying why exactly “nature” needs to be renamed as “natural capital”.